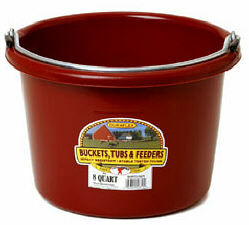 Small, super durable bucket that is ideal for farm, home or general use. Makes a great watering or feeding bucket. Molded from tough polyethylene resin that is impact-resistant. Protects against warpage, and helps prevent stress cracks. Heavy-duty steel eyelets and handle.